The picturesque flower of Diplocaulobium chrysotropis is bright white with yellow, purple and orange specks. The petals of this orchid are quite narrow and smooth. Over the length of the brightly coloured lip it has golden fraying. Diplocaulobium chrysotropis won't grow beyond a few centimetre, so will fit nicely into a small terrarium. This orchid can get bigger by forming multiple bulbs. Diplocaulobium chrysotropis is found in the wild on Papua New Guinea. It is found there in the slightly colder regions at an altitude of 1.000 to 1.300 meter. The plant consists of a single bulb from which a leaf of a few centimetre grows. Each specimen forms one flower. This will have slender petals and a bright lip with gold coloured fraying. It is therefore also often referred to as 'golden keeled Diplocaulobium'. There are also purple and orange specks on the lip. 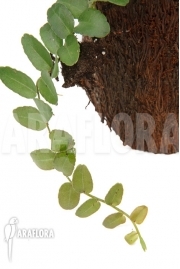 It is possible to keep Diplocaulobium chrysotropis on a piece of hanging bark. Put Diplocaulobium chrysotropis in a light spot, out of direct sunlight. The humidity should be quite high, around 80%. The ideal temperature for Diplocaulobium chrysotropis is around 22⁰C. Don't let the temperature drop below 15⁰C or rise above 30⁰C. For the best results, water the plant using rainwater or distilled water whenever the substrate dries slightly. In practice this will be watering three to five times a week. A proper humidity and plenty of airflow will help prevent infections and disease. Orchid-mix will be a suitable substrate, but you can also attach it to a piece of bark. You can find this and other components in our ‘Plant Accessories’ section. Make sure moisture is able to drain from it. Old flowers can be cut from the plant.